Mary Slessor, a Dundee mill girl, was inspired to travel to Calabar in Western Africa to become a missionary in 1876. Her determination and spirit and the strong connection she made with the local tribes while living with them, meant that she became much more than a missionary and is remembered and celebrated there still, 100 years since her death. Although the first woman to be depicted on a Scottish bank note, she is perhaps now less well known in Scotland. These pages aim to tell her story and celebrate her achievements and continuing legacy, which today still inspires and benefits the people of Southern Nigeria and beyond. Mary Mitchell Slessor was born on 2nd December 1848 into a working class family in Aberdeen. The family moved to Dundee in 1857 in search of work. Her father was a trained shoemaker but due to his struggle with alcoholism, the family suffered very severe hardship. Mary, her mother and older brother Robert had to find work in the mills to support the family, she had five younger siblings and they all lived in a one room house in a slum area of Dundee. The experience of living in poverty and struggling to survive helped Mary to develop the resilience, drive and determination that would prove invaluable in her later life as a missionary in Africa. 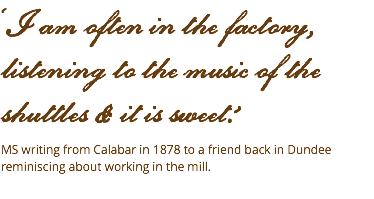 Mary became a mill girl in the Baxter Brothers and Co Ltd. Lower Dens Mill and attended the mill’s half-time school. The Scotland Education Act of 1872 encouraged employers to provide some education for the children that they employed. This meant very long working days for the children who would often attend school for six hours after they had finished their shift in the mill. By the time she was fourteen, Mary was a linen power loom weaver, a skilled job. She became an avid reader and like David Livingstone, would read when she could during her working day, with a book propped on her loom.